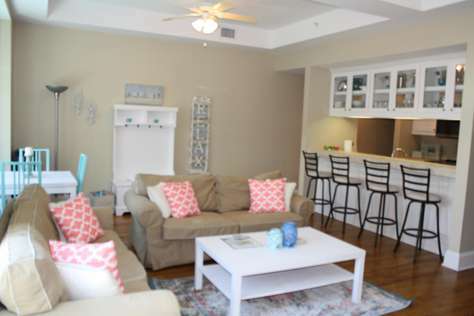 Majestic 1510 is an adorable two bedroom, two bath condo is a MUST STAY! Gulf front views from the large and spacious living/dining/kitchen area are fabulous through the floor-to-ceiling windows leading out to the large balcony. The recently renovated kitchen features new stainless steel appliances, a large breakfast bar, and plenty of storage. Bedrooms and living room boast new flat screens (55" in living room with X-Box) and new hardwood laminate flooring throughout this unit. Guests enjoy secure covered parking and a covered walkway to the 3rd floor, with access to four large modern elevators. Please note only one parking space proviced between Memorial Day and Labor Day, additional is city pay per park one block away. The onsite Majestic Market offers a variety of quick snacks, including homemade pastries, gourmet lunches, fresh salads, Starbucks coffee and more. The Market also sells souvenirs, and has a supply of those little pantry items you may have forgotten. Onsite are five pools: a large outdoor pool; a heated indoor pool; a wading pool with a waterfall; a baby pool, and a poolside snack bar. Majestic Beach Towers also offers its guests two jetted hot tubs. Whether it's strolling on the beach, snorkeling, para-sailing or fishing, close by you'll find opportunities to enjoy everything there is to do in, under, above, or on the water.An onsite fitness center with state-of-the-art equipment includes a steam room and a sauna with gulf views. Private tennis courts are available at no charge.Majestic Beach Towers' amenities are second to none, boasting two indoor pools, two large outdoor pools, bar and grill, tennis courts, convention facilities, movie theater, the best workout facility in town complete with sauna and steam rooms, game room, Starbucks and much more! Everyone is welcome of course! but, the responsible party booking this reservation must be 25 years of age or older and remain present throughout the entire stay. Call today to see this gem! Guests enjoy secure covered parking and a covered walkway to the 3rd floor, with access to four large modern elevators. The onsite Majestic Market offers a variety of quick snacks, including homemade pastries, gourmet lunches, fresh salads, Starbucks coffee and more. The Market also sells souvenirs, and has a supply of those little pantry items you may have forgotten. Onsite are five pools: a large outdoor pool; a heated indoor pool; a wading pool with a waterfall; a baby pool, and a poolside snack bar. Majestic Beach Towers also offers its guests two jetted hot tubs. Whether it's strolling on the beach, snorkeling, para-sailing or fishing, close by you'll find opportunities to enjoy everything there is to do in, under, above, or on the water. This 1,982 sqft 3 bedroom & 3 full bathroom end unit in Sterling Breeze with a private Mother-in-Law suite located in the heart of Panama City Beach; Florida, close to Peir Park. The Gulf front Master Suite features a King bed, flat screen TV, private balcony access and master bath. Guest bedroom has a bunk bed featuring a queen bed on bottom and a twin bed on top. It also has a full sized sleeper sofa and access to the guest bath. Mother-in-Law suite with king bed, kitchenette, private balcony and in-suite bath. The kitchen is equipt with beautiful granite countertops, large sinks and matching appliances. This unit will make memory's to talk about for a lifetime. We hope to see you very soon. We know you’ll fall in love with this unit each and every time you stay. This unit offers amazing views of the beach and the City Pier at Pier Park from the large balcony that you may never want to leave! Really! The condo is an end unit so you will have the most spectacular panoramic views of the beach. The sunsets are breathtaking so be sure to get those in too! The condo will feel like your home away from home and with all the comforts. It’s tastefully decorated with a relaxing feeling. You'll be in paradise! The location, views and activities are perfect for your family and friends to enjoy. It's just perfect! We know you’ll enjoy it. Everyone is welcome of course! but, the responsible party booking this reservation must be 25 years of age or older and remain present throughout the entire stay. Hope to see you soon. This unit offers amazing views of the beach and the city pier from the large balcony that you may never want to leave! Really! 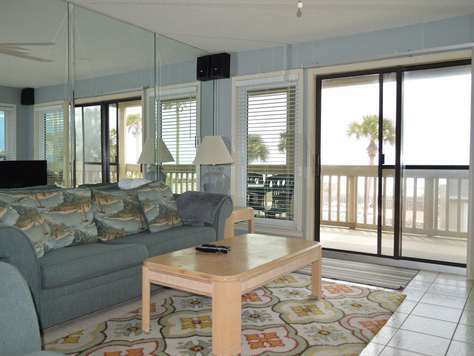 The condo is an end unit so you will have the most spectacular panoramic views of the beach. The sunsets are breathtaking so be sure to get those in too! The condo will feel like your home away from home and with all the comforts. It’s tastefully decorated with a relaxing feeling. You'll be in paradise! We felt the location, views and activities were perfect for our family and friends to enjoy. It's just perfect! We know you’ll enjoy it. Hope to see you soon. This 3 bedroom, 2 bath house is located just walking distance to the sugar white sand of Panama City Beach. It is located in a quiet neighborhood at the west end of the beach. This area is perfect for rest and relaxation, but still just moments away from all the action. This house has an amazing advantage of sitting on stilts, so even though you are 2 blocks from the water; you will be able to see the waves from your front door and enjoy the evening sunsets. The open living room/dining room provides for the perfect arrangement to host your large family or friends during your stay. The house hasbeen newly renovated, providing you all the luxuries of home. The large outdoor deck wraps from the front door, half way around the house, to include the side door as well. You will have plenty of space to enjoy the evening breeze or enjoy a dinner on the deck. The master bedroom features a king sized bed, the second bedroom has a queen bed, while the third bedroom is perfect for the kids since it has 2 twin beds. There is also a sleeper sofa in the living room area if needed. There is parking under the home and in the driveway; providng you with 3 spaces for your vehicles. Everyone is welcome of course! but, the responsible party booking this reservation must be 25 years of age or older and remain present throughout the entire stay. 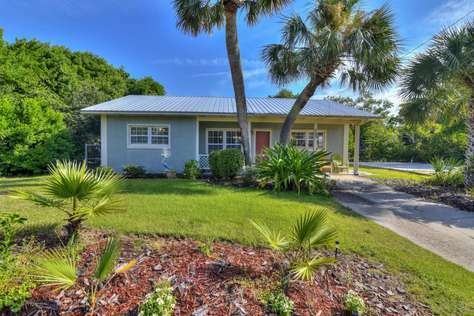 Family friendly newly renovated beach cottage with all the comforts of home located less then two blocks to the white sandy beaches of the emerald coast. 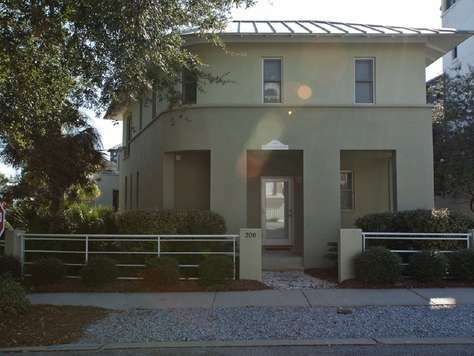 Located in a quiet family friendly neighborhood at the westend of Panama City Beach. No highrise condos and no traffic. 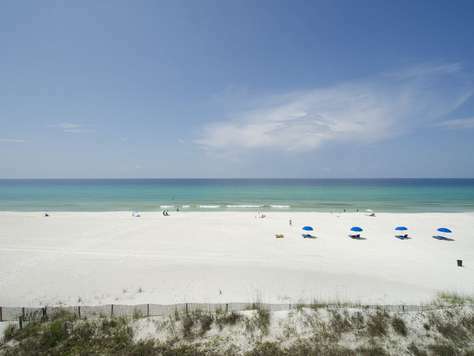 Yet, just 5 to 10 minutes to shopping (Pier Park and 30A), restaurants, movie theater and sports park. Very nicely furnished, with a very private and secluded back yard, screened in patio and out door eating area with a grill, back patio for lounging and out door shower. Bimini is located in the gated, luxurious community of Carillon Beach, just steps away from the pristine white beaches and Emerald Waters of Florida’s Gulf Coast. This bright, immaculate and welcoming cottage is the perfect site for your family’s memorable beach vacation or a quiet romantic getaway. 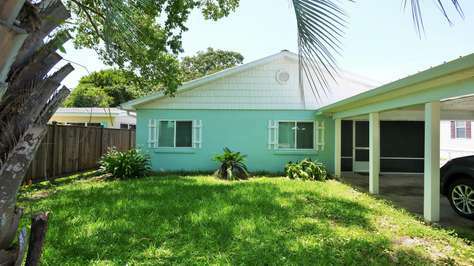 Bimini is a 1,014 sq ft, 2 story, 2 bedroom, 1 1/2 bath home that will accommodate up to 6 comfortably. Enjoy spending time in the open, airy common area of the first floor when you return from the breathtaking white-sand beach or pools. The beach walkover is less than one block from your front door, where resort style lounge chairs and umbrella are set up daily for your exclusive use. Upon returning home, an outdoor shower will make cleanup a breeze. Make use of the grill or fully equipped kitchen to craft your own culinary delights, or visit the many restaurants along 30A. There is two grocery stores within walking distance, making it easy to stock your kitchen or run out for that last minute key ingredient. All reservations with pets will be charged a $125 non-refundable pet fee. 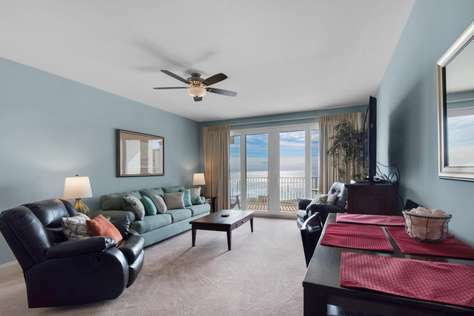 Emerald Isle is an adorable two bedroom, two bathroom condo that is a MUST STAY for every vacation! Gulf front views from the large and spacious living/dining/kitchen area are fabulous through the floor-to-ceiling windows leading out to the large balcony. This unit features a king size bed in the master bedroom with views of the gulf and access to the private balcony. The bedroom does have a flat screen TV. The master bathroom has a tub/shower combo and included updated furnishings. The second bedroom has a king size bed and access to the 2nd bathroom from the bedroom area. The second bathroom has a tub/shower combo as well. Each bathroom comes with a hairdryer, so no need to pack your own. The kitchen comes fully equipped with dishes and cookware for cooking a family meal or to just enjoy a snack when taking a break from the beach. The kitchen includes a regular coffee maker,a Kuerig, microwave, fridge/freezer, and dishwasher. The dining room table comfortable sits 4 and the kitchen bar has stools for the overflow of family. You will enjoy the amazing views from the private balcony that has 2 chairs for sun bathing, a couch and 2 chair set for enjoying the evening relaxing, and even a high top table and 4 chairs for entertaining or enjoying a sunset. The living room includes a large flat screen TV for the games or an evening movie, which you can enjoy from the comfortable sleeper sofa or 2 sitting chairs. The unit does include a large washer and dryer stacked into the hall closet; the perfect necessity for all vacation stays. Guests enjoy secure covered parking in the parking garage below the units or an adjacent covered overflow parking with a covered walkway to the 3rd floor, with access to four large modern elevators. Please note only one parking space provided between Memorial Day and Labor Day. 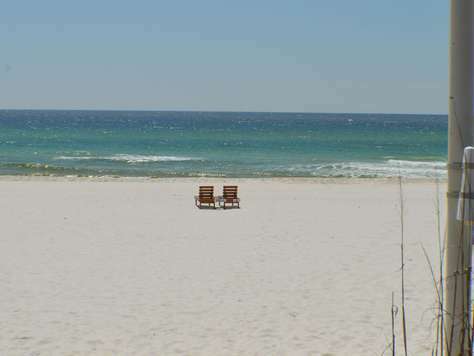 This property also offers 2 complimentary front row beach chairs during your stay, so you can enjoy the emerald coast stress-free. 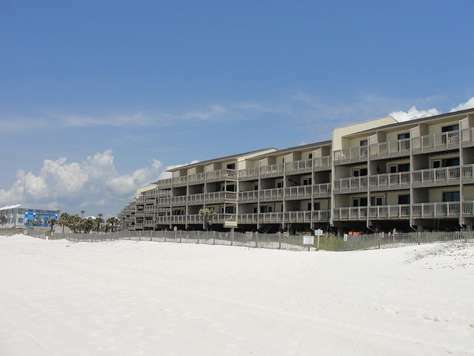 Onsite are two pools: both are located on the gulf side on the ground floor. There is also a hot tub on site and a beach side bar for all your drink needs. The property also features an exercise room, sauna and steam room. You can also find an onsite pavilion with BBQ grills. Whether it's strolling on the beach, snorkeling, para-sailing or fishing, close by you'll find opportunities to enjoy everything there is to do in, under, above, or on the water. Everyone is welcome of course! but, the responsible party booking this reservation must be 25 years of age or older and remain present throughout the entire stay. Call today to see this gem! 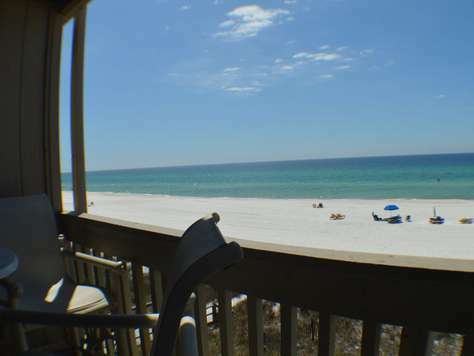 Spacious, cozy beach house with all the comforts of home located two blocks to the white sandy beaches of the emerald coast. You will find this home located in the quiet family friendly neighborhood of Laguna Beach; this neighborhood is much more private and secluded then the east end of Panama City Beach. No highrise condos and no traffic; unless you consider the golf carts "racing" by as traffic. 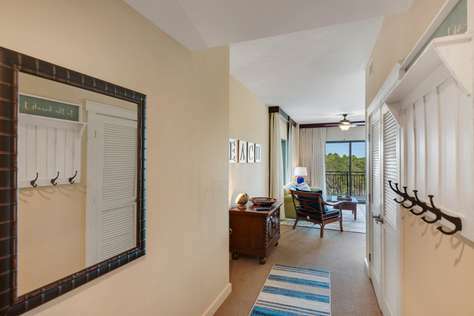 Yet, just 5 to 10 minutes to shopping (Pier Park and 30A), restaurants, movie theater and sports park. This fully furnished 4 bedroom home with 3 full bathrooms decorated to make the beach feel even closer. The first guest room has a queen size bed and private access to one of the three bathrooms with a stand alone shower. The second guest bedroom is next down the hall and features a queen bed. The third guest bedroom is designed specifically with the kids in mind with a set of twin bunk beds. At the end of the hall, you will find the master bedroom with a king sized bed and a private ensuite with a tub/shower combo. The living room is open to the dining area and beautifully upgraded kitchen. The living room has 2 overstuffed sofas and 2 sitting chairs, great for enjoying some family time together. There is another full bathroom just off of the living room with a full sized washer and dryer. The kitchen is beautifully upgraded with granite countertops, stainless steel appliances, cookware, dishes, and even a Keurig for your morning coffee. The large dining room table seats 6, which is perfect for a family dinner or lots of laughs during game night. The home has an outdoor shower in the fenced in back yard, great for kids after a long day at the beach. It also includes a charcoal grill for your cooking convenience with a cabana covering the patio set for those sunset dinners. 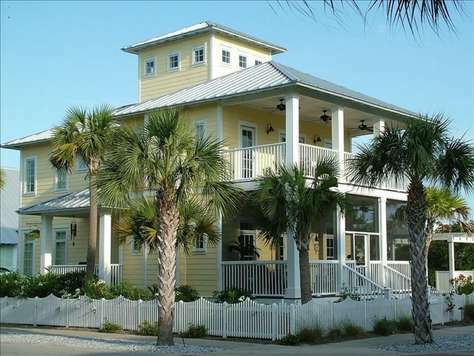 Grand Tortuga’s Crush is a 3 story 5 bedroom home that sleeps 15. Separated by a lovely landscaped courtyard that is overseen by a whimsical sea turtle fountain is the 2 story, 2 bedroom guest house, Grand Tortuga's Squirt, that can be rented with Crush or separately. Sleeping 21 people between the estate, the Grand Tortuga's have plenty of space so everyone can be comfortable. With a spacious living area and a dining area that can seat 21, Crush has room to host the gatherings for both houses. Located on the 2nd floor, the kitchen, dining room, and living area is a spacious room with high ceilings and plenty of natural light. The large open deck is located right off of the living area and has a wonderful built in Broilmaster gas grill for cookouts off the living room and on the open patio of the second floor. There is also a TV room/ bedroom on the 2nd floor with a sofa sleeper and a full bathroom with a walk in shower. The very private Master bedroom is the only room on the 3rd floor. It has a King bed, sitting area, full bathroom with walk in shower featuring a rainfall shower head and a private balcony. Located off the central hallway, on the first floor, is two King bedrooms and a bunkroom with 2 sets of twin bunk beds and a twin trundle bed. There are 2 shared bathrooms at each end of the hallway. On the first floor you will also find the laundry room, outdoor shower, and a large screened in porch that overlooks the courtyard. Wonderful split level house large enough for one family or three small families. CRUSH rents alone, or with SQUIRT. Squirt also rents by itself. Located just steps from the Meeting House and the beach in Carillon Beach, Grand Tortuga’s Squirt is a guest house that stands on its own. Larger than most of the small cottages in Carillon Beach, this 2 story, 2 bedroom is the guest house for Grand Tortuga’s Crush but it is separated by a lush courtyard and offers all the privacy of a stand alone house. The 1st floor is an open space with a compact kitchen, living room, and dining area. The living area has floor to ceiling windows that overlook the expansive terrace. The outdoor space has lounge chairs and a Broilmaster gas grill, perfect for all those summertime cookouts. There is a full bath on the 1st floor with a tub shower combination. The second floor has a Queen bedroom and a King bedroom with a shared bathroom. The 2nd floor bathroom is very spacious with a European jetted tub, separate walk in shower and a well lit, separated double vanity area. Pricing is for Guest House (Squirt) only! Rents Saturday to Saturday in Spring Break & Summer Season. Please call if you would like to book both houses Grand Tortuga's CRUSH & SQUIRT, to sleep 21 in your family vacation. Two chairs and 1 umbrella in the sand are included from March to mid-October. This House is available to be rented with the Grand Tortuga's Crush House or just Squirt, by itself. No dogs are allowed on the Beach or in the sand area in Bay County. There is a Pet Friendly area at Pier Park Pier of about 400 feet wide. Leash law is in effect in Bay County Florida at all times. Take a look at our condo's location …Wow! This 7th floor condo is located where everyone wants to vacation! An amazing condo, in an amazing location! Everyone is welcome of course! but, the responsible party booking this reservation must be 25 years of age or older and remain present throughout the entire stay. Your new vacation destination is located on the 7th floor overlooking the beautiful Gulf of Mexico. You will be given your own personal, secure door code and may go directly to the condo. 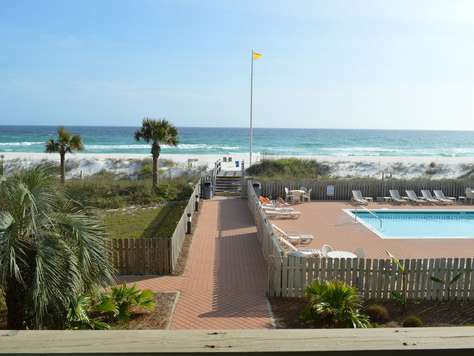 This Condo is situated on the east end of Panama City Beach near St. Andrews State Park. This recently updated condo has a King in the master with private access to the balcony and two queens in the 2nd bedroom. If you are looking for a great Gulf front condo look no further! You will be thrilled with your view from the balcony! It is private and quiet, but so close to everything! Of course your new vacation destination comes with all the added luxuries you'd expect, such as FLAT SCREEN TVs,WASHER AND DRYER, OUR PERSONAL WI-FI, and Fully Furnished Kitchen. We've skimped on nothing for this vacation condo. 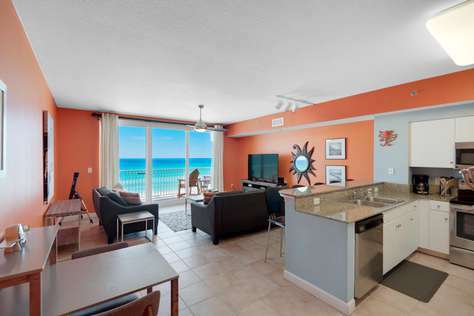 The open concept living, dining and kitchen has beautiful views of the beach off the balcony. 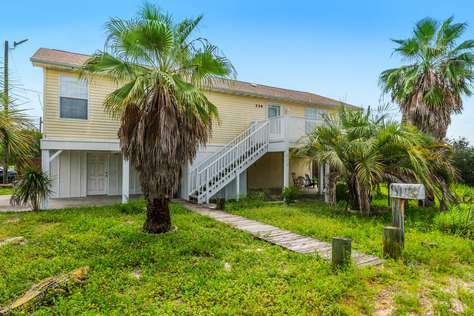 This complex is on 700ft of beach front with a year round heated pool, Kiddie pool, hot tub,two grilling areas, tennis courts, shuffle boards, basketball and a batting cage. Located on the quiet, west end of Panama City's beaches, Carillon has three pools, playground, tennis, boating, beach club, restaurants, and the Carillon market. You will feel as if you are a world away. But for those family members who enjoy the activities, Carillon is only minutes from numerous world-class golf courses, Shipwreck Island Water Park, Ripley's Believe it or Not, WonderWorks, Gulf World Marine Park, putt-putt golf, bumper cars, Seaside, Pier Park shopping and several nationally-recognized state parks. Want to fish, sail, scuba dive, or snorkel? We have that, too! This beautiful, two-story, Creole-style home overlooking Lake Carillon is professionally decorated and boasts a huge, front porch on each floor on which to view the gorgeous sunsets. It has hardwood floors throughout with carpeting in the upstairs bedrooms, tile in the bathrooms, outdoor shower, and granite countertops in the kitchen. There are two bedrooms upstairs with a study downstairs that converts to a bedroom with private bath, or the perfect dressing room for the bride. Enjoy just a short, one-block stroll to the beach walkover with a dip in the pool halfway between, or walk the other direction and within minutes you are in the quaint New Orleans-style Carillon Market eating, shopping, hitting the gym or enjoying the spa. Follow it up with an evening stroll throughout the picturesque village, or return home to roast marshmallows on the backyard built-in BBQ pit. The master bedroom is upstairs and has a king-size bed, TV/VCR/DVD, walk-in closet, and full bath. The second upstairs bedroom has bunk beds and TV-VCR with a second bathroom just across the hall that conveniently has a washer and dryer. The downstairs study has a pull-down, full-size, Murphy bed and sliding French doors which convert this room into a cozy, private bedroom with private, handicapped-accessible bathroom. There is also a queen-size sleeper in the living room. Internet WiFi service provided. Outdoor BBQ grill. Plenty of parking. Seasonal Beach Chair Service.This rental includes 2 beach chairs and umbrella every day of your stay from March-mid October; weather permitting. 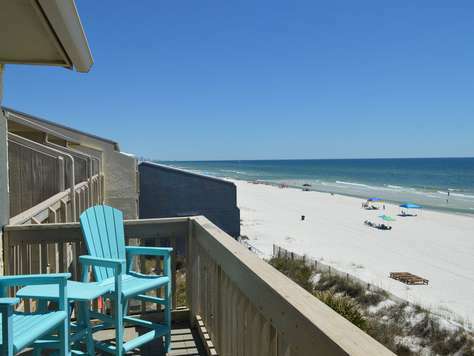 Our beach house is in a prime location less than 98 steps away from almost one mile of sugar white sand at Carillon Beach. 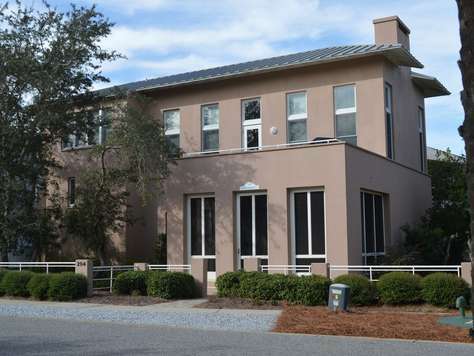 No need to tolerate the Seaside traffic or cross 30A to get to the beach when you have all of the privacy and security of Carillon with the conveniences of a vibrant gated resort community. Carillon, located just beyond the east end of 30-A, is a gated community of single-family homes located within steps to Carillon Beach, Downtown Carillon, Lake Powell and bicycle paths that will take you along the adorable beach communities of Rosemary, Seaside, and Seagrove, and several state parks. There are plenty of amenities at Carillon; including three pools (one heated, one gulf front), beach club, two tennis courts, kiddie pool, basketball court, bicycle rental and, of course, plenty of beach front to enjoy. Enjoy live music at 'Grooving on the Green' during summer, or listen to the music of the Gulf right out your front door. Carillon Beach Chair Service is provided (March 1- October 15) for your pleasure which includes two chaise lounge chairs and a large beach umbrella. Pier Park, the Emerald's Coast newest destination shopping/theater/restaurant complex, is just a 10 minute drive away. Getting to Once Upon A Time is now even easier with the opening of our new airport, Northwest Florida Beaches International Airport (ECP) in 2011. Start and end your day sipping your favorite beverage on the third floor tower deck knowing sunrises and sunsets only look this way at the beach. This tropical beach home is brimming with special touches throughout; granite counter tops from South Africa, Italian limestone floors and walls in the bathrooms, European satin-nickel fixtures, Australian cypress hardwood floors throughout and private porches off each bedroom and main living area. Decorated in West Indian style, this beach house includes all the comforts of home including first-class furnishings, a TV in each bedroom and for those of you who must 'work' while on vacation, you will appreciate our high speed internet and WiFi. The master bedroom is a private island paradise tucked away on the second level, and is decorated with tranquil sea foam colors and appointed with a king-size bed, and features a private porch with comfortable chairs that makes the perfect place for breakfast or relaxing seclusion. The master bath features both a stand-up shower and separate tub to melt away any stresses from work or home. His and hers sinks along with an over sized master closet offer ample storage for a week or a month in paradise. Also located on the second floor is a second private bedroom/bath suite with a queen bed and private deck, a nautical bunk nook with two beds and a bright 'kids room' with a queen Murphy bed, porch and TV. The first floor guest room is a private suite with queen-sized, pineapple-themed luxury bedding. You will enjoy delightful quiet mornings sipping coffee on the screened porch overlooking the beach boardwalk before heading to the beach for another sun-drenched day of emerald-colored waves that lap the shores of our sugar-white sand beaches. For the quick grocery trip, Publix and Winn Dixie are just 1/4 mile away. For added convenience, a washer and dryer are also included. May your time at our new beach paradise 'Once Upon A Time' be filled with relaxing sunsets, cool drinks, and sand between your toes. We know you will come back every year so do not miss your chance to book your reservation today! Please check our calendar for availability. We keep it up to date. Thanks. 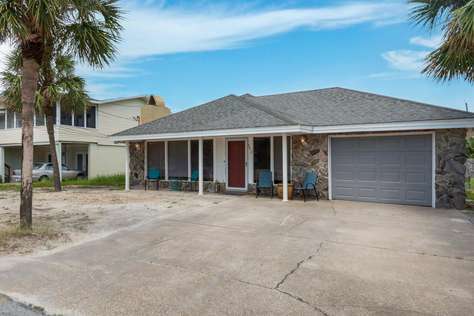 Family friendly beach house with a screened in pool and all the comforts of home located less then two blocks to the white sandy beaches of the emerald coast. Located in a quiet family friendly neighborhood at the westend of Panama City Beach. This neighborhood is much more private and secluded then the east end of Panama City Beach. No highrise condos and no traffic. 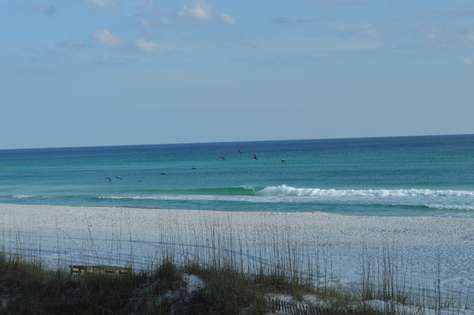 Yet, just 10 minutes to shopping (Pier Park and 30A), restaurants, movie theater and sports park. Fully furnished, outdoor grill with eating area, back deck for lounging and out door shower. 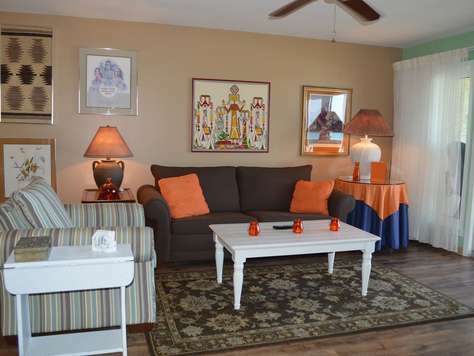 Pinnacle Port C3-401 is an adorable two bedroom, two bath condo and is a MUST STAY! 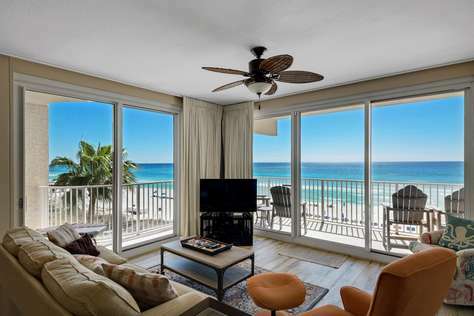 Gulf front views from the living/dining/kitchen area are fabulous through the floor-to-ceiling glass sliding doors leading out to the large balcony with gorgeous views to east and west of the worlds most beautiful beaches. The master bedroom features a king bed and extra large windows for waking up to the wonderful beach views. The second bedroom has twin beds suitable for all ages. From the front of the entrance you have views of Dune Lake! The recently updated kitchen features nice appliances, a large breakfast bar, and plenty of storage. Bedrooms and living room boast flat screen televisions and new hardwood laminate flooring throughout this unit. This unit is fully equipt with all of the items to make it your home while in Panama City Beach. The property itself has the following for you to enjoy during your stay:a large pool that is attached to the tower building and offers a roof over half of the pool and is heated in the winter months, a smaller pool, four tennis courts, shuffleboard courts, picnic area where grills are provided, saunas located on the ground floor of the tower building for men and women, and an exercise room for those over the age of 16. There is a docks on property that allows for a good fishing spot. We think you will feel safe and secure with a 24/7 guard gate and patrolling security guards. 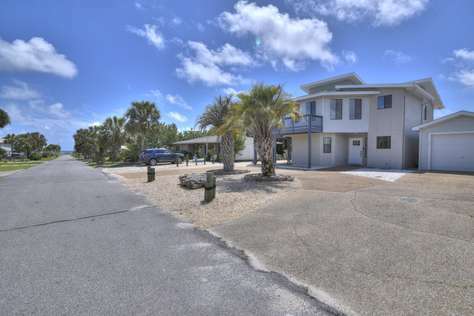 Ramsgate Harbour #6 is a 2 bedroom, 2.5 bath Gulf front townhome on the peaceful west end of Panama City Beach. 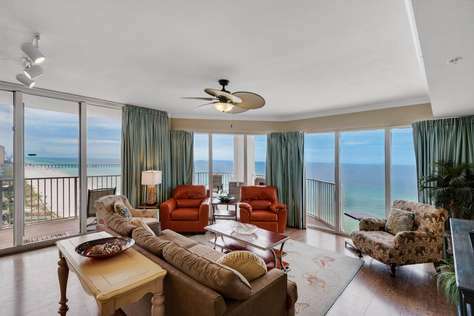 This 2 level condo has stunning gulf views from the master bedroom and the living room. Located on the first floor you will find the living room and dining area, kitchen, half bath, and a laundry area with washer and dryer. 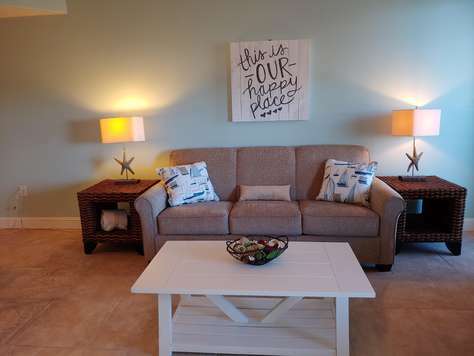 The living room features a couch to enjoy the gulf views from or a sleeper sofa for added sleeping arrangements to accommodate the whole family. You will find the flooring has been been recently updated this past year to provide you with the luxury you won't find anywhere else. You can walk right out th sliding glass door onto the balcony for a morning cup of coffee or a nice glass of wine at sunset. The balcony is large enough for the whole family to spend time gazing at the amazing gulf views. The second level is just as accommodating as the first level, with newly updated carpet all throughout the bedrooms. The master bedroom features a king bed and another balcony that overlooks the emerald green waters of the gulf, that will definitely satisfy the dream vacation for beach lovers. The guest bedroom with twin beds is on the opposite end of the hall providing a space that is great for more adults or children. Each bedroom upstairs features their own bathroom, each with tub/shower combo, so there will be no sharing with the others when it is time to hit the beach or a night on the town. Ramsgate Harbour has covered parking, a community Gulf front pool, and an onsite office for check in. You will see why this has been a hidden gem of the beach and will want to visit year after year. As a special treat, each reservation between March 1 and October 15 comes with complimentary beach service of 2 chairs and an umbrella set up on the beach for you every day of your stay; weather permitting! Ramsgate Harbour 8 has been remodeled with new cabinets, granite counter tops, new sinks, faucets, light fixtures, and all new appliances. It is on the 2nd floor(3rd level) with covered parking available. It has two upstairs bedrooms, two upstairs full baths, and a 1/2 bath downstairs. The two separate beachfront balconies offer many views and a very open floor plan downstairs provides for all the comforts of home away from home. The kitchen, dining area, and den all open to one another with a beautiful view from the glass doors and windows that open onto the downstairs balcony. This unit can sleep up to 6 with a king in the master, queen bed in guest bedroom and a queen sleeper sofa in the living room. Everyone is welcome of course! but, the responsible party booking this reservation must be 25 years of age or older and remain present throughout the entire stay. This property is not to be missed for a wonderful family vacation. Ramsgate Harbour has covered parking, a community Gulf front pool, and an onsite office for check in. Our Beach Front Balconies are the Perfect Place to Unwind! Beautifully renovated, Ramsgate Harbour #9 is continuously being updated by its owners. This condo has new furniture, stainless steel appliances, ceiling fans, mattresses, kitchen utensils, decor, paint and tile! Flat Screen TV in each bedroom, in addition to all new bedding. This two story townhouse has the kitchen, dining area, living area, washer & dryer and half bath on the first level. A flight of stairs takes you to the upper level where you will find the master bedroom featuring a king bed with a private balcony and private bathroom, with double sinks and walk-in shower, as well as the two twin beds in the guest bedroom, full bath with tub/shower combo, all for a night of relaxation. Everyone is welcome of course! but, the responsible party booking this reservation must be 25 years of age or older and remain present throughout the entire stay. This is a hidden gem in this complex. Ramsgate Harbour 10 is a 2 bedroom, 2 bath one level Gulf front flat. An oversized Gulf front balcony runs the length of the living room and master bedroom for constant views of the sparkling emerald green waters. The master bedroom has a king bed and private bath and the guest room has twin beds and its own bath. All new stainless appliances, with granite counter tops, new cabinets, all in the kitchen. Master Bathroom has now been renovated with walk in shower and double vanities. Everyone is welcome of course! but, the responsible party booking this reservation must be 25 years of age or older and remain present throughout the entire stay. Ramsgate Harbour has covered parking, a community Gulf front pool, and an onsite office for check in. 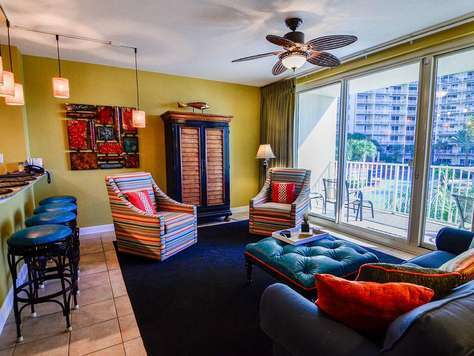 Ramsgate Harbour 15 is a beautiffuly decorated townhome right on the emerald green waters of the Gulf of Mexico. Just steps from the beach, this condo sleeps a maximum of six people and has 2 seperate balconies. 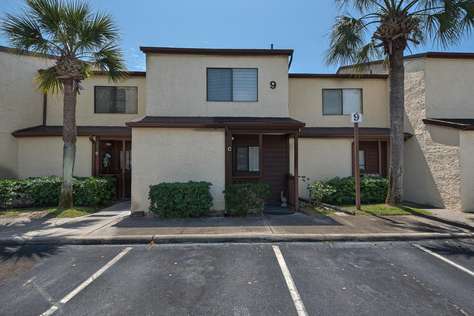 Located next to the upscale community of Carillon Beach, and close to supermarkets and restaurants, this apartment features a split level floor plan: kitchen, dining room. half bathroom, living room and spacious balcony with spectacular views of the beach. On the upper level, you will find the master bedroom featuring a king bed with a balcony, the guest bedroom with twin beds, and two baths. 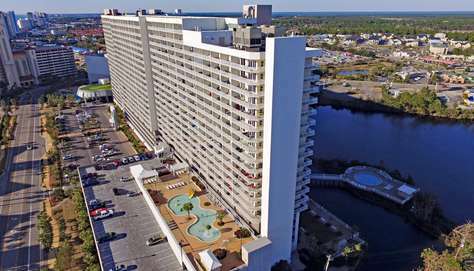 In addition this unit has high speed wireless internet, enjoy the beachside pool, covered parking, and an on-site rental office. A GREAT place for a beach vacation. Everyone is welcome of course! but, the responsible party booking this reservation must be 25 years of age or older and remain present throughout the entire stay. 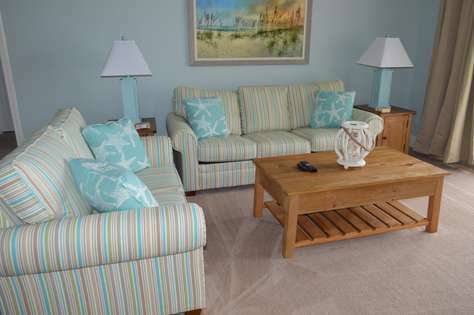 2 chairs and 1 umbrella in the sand are included with this rental from March to mid-October; weather permitting. Ramsgate Harbour 16 is a 2 bedroom, 2 bath one story flat. This spacious condo has an oversized Gulf front balcony that runs the length of the living room and master bedroom. Sleeping 8, this unit has room for everyone. The master bedroom has a king bed with a private bath with a walk in shower. The guest bedroom has 2 twin custom built-in bunk beds and a queen bed, in addition to Queen sleeper sofa in the living room. There is Internet and WiFi access in the condo. This flat floor plan condo has had a total renovation, NO Carpet, smooth ceilings, quiet close cabinets, quartz counter tops throughout kitchen and bathrooms. Everyone is welcome of course! but, the responsible party booking this reservation must be 25 years of age or older and remain present throughout the entire stay. Ramsgate Harbour has covered parking, a community Gulf front pool, and an onsite office for check in. Ramsgate Harbour 17 is located next to the upscale community of Carillon Beach, and close to supermarkets and restaurants, this apartment features a bi-level floor plan. the lower level has the kitchen, dining room, half bathroom, living room and spacious balcony with spectacular views of the beach. On the upper level you will find the king in the master bedroom with a balcony, the guest bedroom with a queen bed, and two baths. In addition, enjoy the beachside pool and pavilion, covered parking, and on-site rental desk. An overall GREAT place for a beach vacation. Everyone is welcome of course! but, the responsible party booking this reservation must be 25 years of age or older and remain present throughout the entire stay. 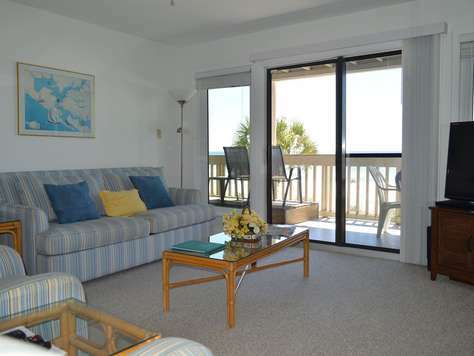 Ramsgate Harbour 18 is an amazing beach front condo sure to entice any family orcouple vacation. This secluded located next to the upscale community of Carillon Beach, and close to supermarkets and restaurants, this apartment features a split level floor plan: the lower level has the kitchen, dining room, half bathroom, living room and spacious balcony with spectacular views of the beach. On the upper level you will find the master bedroomfeaturing a king with a balcony, the guest bedroom with a queen bed, and two baths. In addition, enjoy the beachside pool, covered parking. Everyone is welcome of course! but, the responsible party booking this reservation must be 25 years of age or older and remain present throughout the entire stay. Ramsgate Harbour has covered parking, a community Gulf front pool, and an onsite office for check in. With a beautifully updated kitchen, Ramsgate Harbour 26 offers all the comforts of home while on vacation. Sleeping 7, this 2 story, 2 bedroom Gulf front condo offers plenty of room for everyone to be comfortable. The kitchen and living room are on the first level. The master bedroom with a King bed, private bath, and private balcony is on the second level. The guest bedroom with a set of twin bunks and a twinbed is also on the second level. There is a Queen sofa sleeper in the living room. Each bedroom and the living room have TV’s. Everyone is welcome of course! but, the responsible party booking this reservation must be 25 years of age or older and remain present throughout the entire stay. Ramsgate Harbour has covered parking, a community Gulf front pool, and an onsite office for check in. 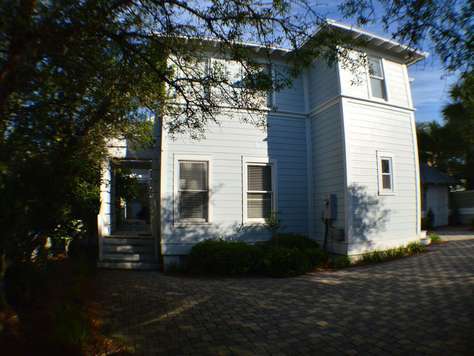 Ramsgate Harbour 27 is a 2 story Gulf front townhouse. Sleeping 6, unit 27 has 2 bedrooms and 2.5 baths. The beautifully updated kitchen and living room are on the first level. The master bedroom with a King bed and the guest bedroom with 2 twin beds is on the second level. There are large Gulf front balconies off the Living Room and Master Bedroom. Have those family meals around the dining table, which seats 6 and two at the breakfast bar. Two recliners in the living room for those favorite shows to watch on the flat screen TV. Everyone is welcome of course! but, the responsible party booking this reservation must be 25 years of age or older and remain present throughout the entire stay. Ramsgate Harbour has covered parking, a community Gulf front pool, and an onsite office for check in. 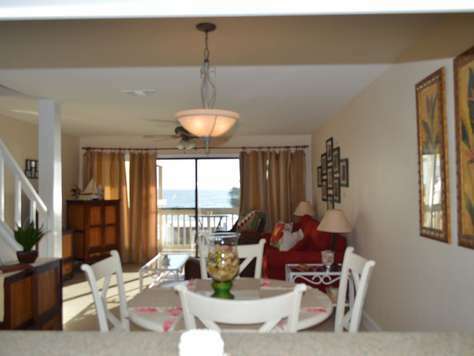 Ramsgate Harbour 31 is a 2 bedroom 2 bath one level gulf front condo. Located on the first level(second story) this unit has been remodeled to make your stay as comfortable as possible. The kitchen has been upgraded with new appliances, cabinets, and granite countertops. 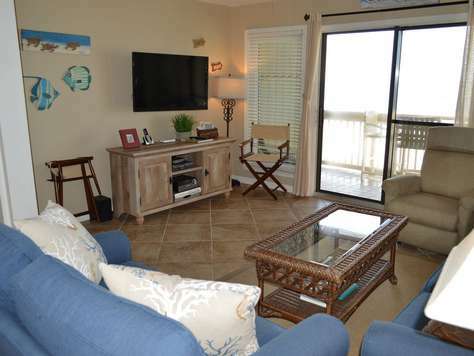 The living room has a large flat screen television and great views of the Gulf. The master bedroom has a king bed and a private bathroom with a walk in shower. The master bedroom also has views of the gulf. The guest bedroom has a queen bed and there is a queen sofa sleeper in the living room as well. Ramsgate Harbour has covered parking, a community Gulf front pool, and an onsite office for check in. Everyone is welcome of course! but, the responsible party booking this reservation must be 25 years of age or older and remain present throughout the entire stay. Ramsgate Harbour 4 is a delightfully decorated two bedroom, two bath, one level apartment that is perfect for someone who wants one story living. The decorating scheme is such that you know you are at the beach while providing both comfort and featuring unique decorator touches throughout. Both the living room and master bedroom offer access to the wide balcony and awesomely breathtaking views of the Gulf. The cool tile flooring of the balcony combined with the Gulf breezes make for a great venue for outdoor living. The master bedroom has a king bed and private bath with double sinks and walk-in shower. The guest room has a queen bed and easy access to the 2nd bath with tub/shower combo. This unit comes complete with a full size washer and dryer that are discreetly tucked away yet easily accessed in the foyer hall closet. 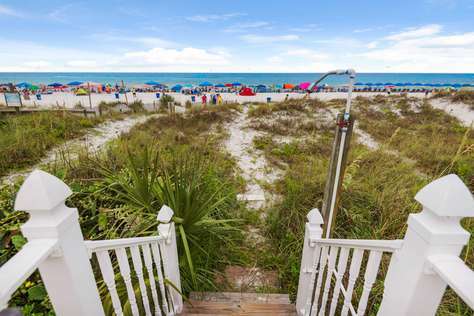 There are only 15 steps down to the beach access, and the boardwalk is just one step up from the sandy beach. Everyone is welcome of course! but, the responsible party booking this reservation must be 25 years of age or older and remain present throughout the entire stay. Ramsgate Harbour has covered parking, a community Gulf front pool, and an onsite office for check in. 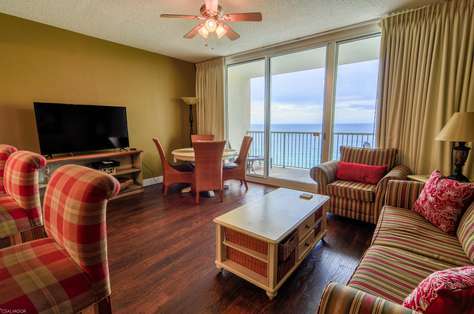 Ramsgate Harbour 40 is a beautifully redecorated 2 bedroom, 2 bath Gulf front condo. This unit has been completely renovated with your comfort in mind. The kitchen is updated with new cabinets, countertops and appliances. With its West facing windows, the bright and beachy living room offers amazing panoramic views of the Gulf and opens to a very large balcony. 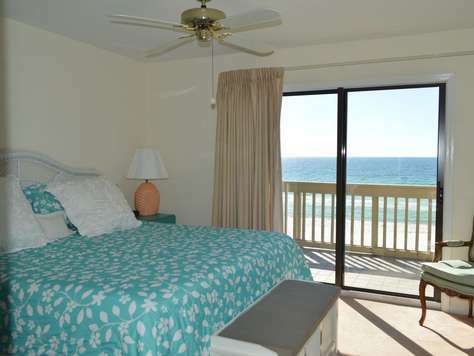 The master bedroom has a King bed and also has access to the large gulf front balcony. You can wake up every morning to the sight of the sparkling emerald waters! The master bath has been completely remodeled with new cabinets and a garden tub. The guest room has a twin bed and a full sized bed, with access to a private bathroomof it's own. Everyone is welcome of course! but, the responsible party booking this reservation must be 25 years of age or older and remain present throughout the entire stay. Ramsgate Harbour has covered parking, a community Gulf front pool, and an onsite office for check in. Beautifully updated two story, 2 bedroom / 2.5 bath condo on the west end of Panama City Beach with gulf front balconies off the living room area and master bedroom. Ramsgate Harbour 41 is located in the middle of the complex and is close to the grilling area at the east end of the parking lot, or the grills at the pool and covered picnic tables. Enjoy the unobstructed views of the sand, sun and fun from either balcony. Catch the waves rolling in, birds soaring, or a pod of dolphins. This condo is perfect for two couples, or parents and adult children. Everyone is welcome of course! but, the responsible party booking this reservation must be 25 years of age or older and remain present throughout the entire stay. 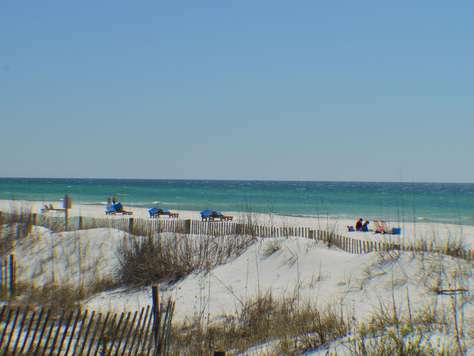 Come stay at a hidden gem along the beautiful Emerald Coast. Once you stay at Ramsgate Harbour, you will feel that this is your second home. Recently updated, Ramsgate Harbour 49, with massive master shower en-suite off bedroom is sure to make any vacation a relaxation. This flat is centrally located in the complex, near the pool. Once inside, there are no stairs to climb to get to the bedrooms. The master bedroom has a king size bed and a unique bed set up in the guest room of a queen size bed and set of twin bunks to sleep more family during your vacation.This unit also has a full size washer and dryer and a sleeper sofa in the living room. Newer kitchen cabinetry, granite counter tops and appliances. Everyone is welcome of course but, the responsible party booking this reservation must be 25 years of age or older and remain present throughout the entire stay. Ramsgate Harbour has covered parking, a community Gulf front pool, and an onsite office for check in. You are the only thing missing from this picture. Wake up to the gorgeous waters of the Gulf. 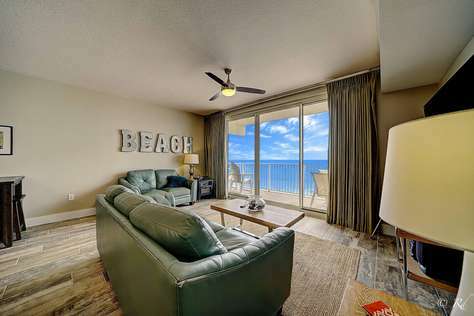 The oversized Gulf front balcony runs the length of the living room and master bedroom of this 2 bedroom 2 bath condo on the West End of Panama City Beach. Ramsgate Harbour 55 is a spacious unit located close to the pool. "Indulge" as the condo says. Soak in the garden tub in the master en-suite and see the waves in the morning as you first wake up! The unit has a living room, dining room area, and full equipped kitchen. The master bedroom has a king size bed, the guest bedroom has a queen sized bed,and a sleeper sofa in the living room. You also have the convience of a full size washer & dryer. Everyone is welcome of course! but, the responsible party booking this reservation must be 25 years of age or older and remain present throughout the entire stay. Ramsgate Harbour has covered parking, a community Gulf front pool, and an onsite office for check in. 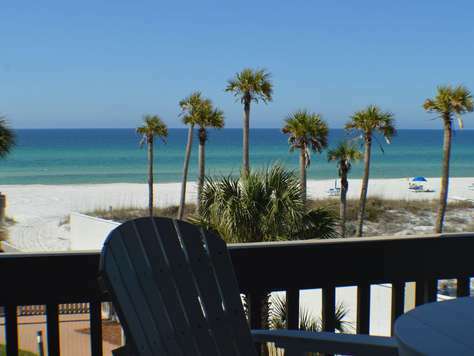 Ramsgate 58 is a 2 bedroom, 2 bath one level gulf front condo located on the quiet west end of Panama City Beach. This unit is close to the pool and uniquely positioned such that the living room windows face both south and west. Just steps away are the sugar white sands of the beach which make it a great place for your family vacation. This multi-unit complex offers units on the same floor, so large groups can stay together while still enjoying their privacy. Everyone is welcome of course! but, the responsible party booking this reservation must be 25 years of age or older and remain present throughout the entire stay. This spacious condo has a full size washer and dryer, a king bed in the master and a large garden tub in the en-suite master bathroom. The living room has a smart TV for those who like streaming pictures or shows. The guest bedroom has 2 double beds and a sleeper sofa in the living room. At Ramsgate Harbour, you have the best of all worlds - from uncrowded beaches out of your back door to family entertainment just a few short miles away. Ramsgate Harbour has covered parking, a community Gulf front pool, and an onsite office for check in. Ramsgate Harbour 61 is a gulf front 2 bedroom, 2 bath flat. Located on the first level(second story) unit 61 has been renovated to make your stay as comfortable as possible. The kitchen has been upgraded with new appliances, cabinets, and granite countertops. The living room has a large flat screen television and great views of the gulf and the pool. The master bedroom has a king bed and a private bathroom with a jacuzzi tub. The master bedroom also has views of the Gulf. The guest bedroom has a queen bed and there is a queen sofa sleeper in the living room. This unit includes a washer/dryer for added convienence. Ramsgate Harbour has covered parking, a community Gulf front pool, and an onsite office for check in. Everyone is welcome of course! but, the responsible party booking this reservation must be 25 years of age or older and remain present throughout the entire stay. Ramsgate Harbour 62 is a 2 bedroom, 2.5 bath gulf front townhome on the desirable west end of Panama City Beach. Located in a quiet multi-unit condominium complex, Ramsgate Harbour 62 is the perfect getaway spot for your vacation. 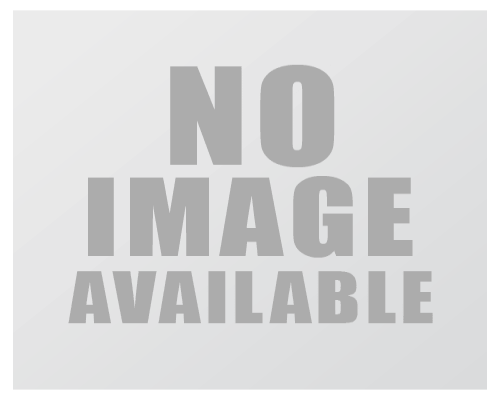 This 2 story townhome sleeps 6 and has plenty of space for everyone to be comfortable. The soft, southing cream color of the walls both welcome and relax you, yet the bold, red sofa seems to say, "Come on in”. With new tile floors throughout the first level, this unit has a full size washer and dryer discreetly but handily tucked away in the entryway closet. In addition to a well-equipped, updated kitchen, the dining area (which seats four at the table and two at the bar) offers plenty of room for family board games. You will also enjoy the new furniture and a new flat screen television. This lovely unit has everything you need for a relaxing stay. The covered balcony directly accessed from the living area has amazing views of the Gulf and is a great place to enjoy the sunset. The second level has a gulf front master king bedroom with private bath and private balcony. The master balcony is uncovered and perfect for early morning coffee or sunbathing. A guest bedroom with twin beds and guest bathroom is also located on the second level. With designer touches throughout, this unit entreats its guests to "LIVE, LAUGH and LOVE". Everyone is welcome of course! but, the responsible party booking this reservation must be 25 years of age or older and remain present throughout the entire stay. Ramsgate Harbour has a gulf front community pool, covered parking, and an onsite office for easy check in. This renovated contemporary kitchen & dining room has modern finishes of granite, stainless steel appliances; bottom freezer, double oven & microwave set in wall, cook-top, dishwasher and more. Ramsgate 63 is an updated townhouse style condo at Ramsgate Harbour. 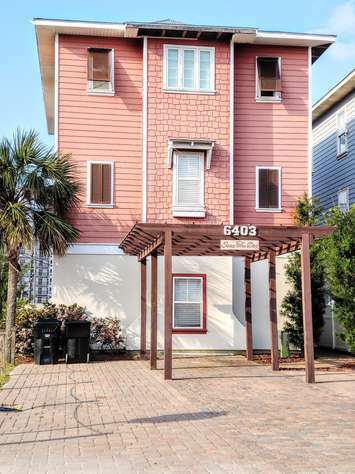 Located next to the upscale community of Carillon Beach, and close to supermarkets and restaurants, this condo features a split level floor plan. The lower level has a newly updated kitchen with upgraded appliances. The dining room and living room have carpet. The living room has a large flat screen smart television. The spacious balcony with spectacular views of the beach has new furniture. On the upper level you will find the master bedroom with a king size bed, private bath, and a balcony. The refurnished guest bedroom has a daybed with a hanging corner reading fixture, bunk beds with a full size on the bottom and twin top bunk overhead. New wall-mounted 32” digital flat screen TV w/built-in DVD player and new USB ports at outlet for more “get-away” fun make this room perfect for the kids. The unit has a sleeper sofa in the living room and also has a washer & dryer for added convienence. Everyone is welcome of course! but, the responsible party booking this reservation must be 25 years of age or older and remain present throughout the entire stay. Ramsgate Harbour has covered parking, a community Gulf front pool, and an onsite office for check in. This wonderfully designed house, complete with all the renovations, is sure to provide the vacation to remember. No need to rent a condo, when you can rent this entire house for your family just across the street from the beach. Everyone is welcome of course! but, the responsible party booking this reservation must be 25 years of age or older and remain present throughout the entire stay. 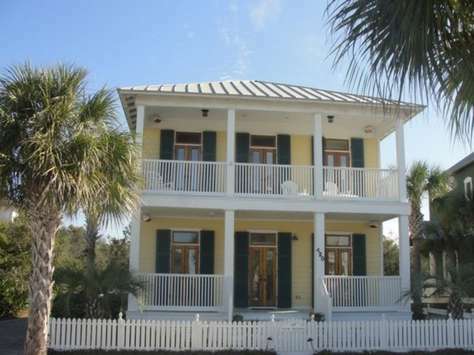 This house is situated on the east end of Panama City Beach near St. Andrews State Park. 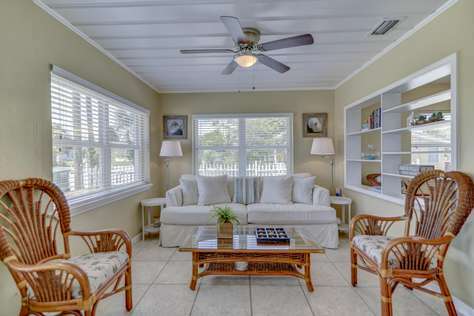 This older home, which has been recently renovated, offers you the quaint beach home feel, before all the high rise condos were built, while still providing you with the recent luxury finishings those condos have to offer. It has a Queen in the master bedroom, a queen in the 2nd bedroom, and 2 sets of bunk beds which would make a great kids room. It also includes a sleeper sofa, if you need a reason to bring more family for the vacation. It is private and quiet, but so close to everything! This home does include a 1 car garage, a nice large yard with patio area, fully equipped kitchen, washer/dryer, and Wifi. 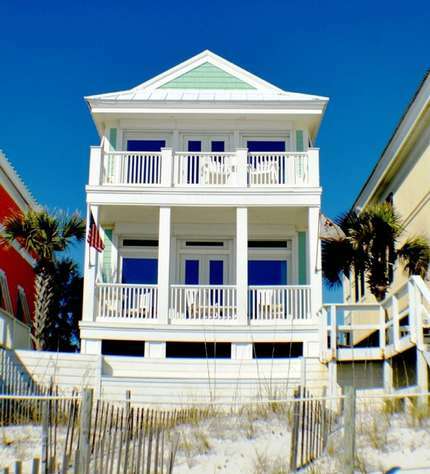 Come relax in this bright and beautiful 3 story beach home. Don't spend your precious vacation time waiting for elevators, trying to find a private spot poolside, or driving around looking for a parking spot. This beautiful home has its own private pool and parking for 6+. This 2700 sq. ft. home is flooded with natural light and has an open concept floor plan. With 3 master suites, each with their own 32' HDTV, the adults can all have their own space while the kids have many sleeping options. There is a bunk bed, a roll away bed, a queen sized sleeper sofa in the family/game room and a queen sized sleeper sofa in the 2nd floor living area. In total, there's enough beds for 14! The lower level features 2 master suites along with a laundry room that has a full sized washer and dryer. Walk up to the main level and you'll feel right at home with comfortable seating, a 55" LED HDTV with BluRay player and Comcast/Xfinity service throughout the home, and a gourmet, fully stocked kitchen (including a Keurig). There is enough seating for 14 people to dine. A half bath is conveniently located on the main level as well. The 3rd level is a great space to allow the kids to enjoy board games and card games at the poker table or relax and enjoy a movie (DVD's provided). There is a separate master suite with full bath on the 3rd level as well. Divider panels can close off the bunk beds for privacy making this 4th bedroom area spacious and comfortable. The pool area is a place you'll love to relax in privacy. There is a calming fire pit where you can unwind on one of the Adirondack chairs. A sun deck inside the pool is the perfect place to lounge and get a tan. A grill is provided to cook up some of the local, fresh seafood or burgers while the kids play in the pool. You'll also find a patio table and chairs to enjoy your meal outside while watching the gorgeous sunsets. This home is the perfect place for family reunions or gathering with a large group of friends. Located on the 'chill' end of the beach, you're close enough to everything without all the noise and traffic. BeachyCations is a luxury vacation rental management company. 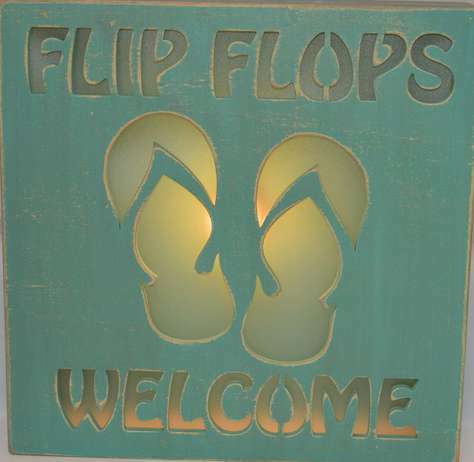 We are apart of the infamous Beachy Beach Real Estate founded in 2006. We are well known for our personalized professional service that responds to YOUR specific needs. Our goal is to make every stay relaxing and effortless. we have made it our personal goal for you to love your home away from home! Our friendly staff will be available for you whenever you have questions or concerns. Trust BeachyCations with your next visit, and learn what that “Beachy” state of mind is all about! Shores of Panama, located right on the sand with a private beach, it is a modern 23 story resort with all the amenities you expect from a world class resort. The grand lobby is beautifully appointed with a concierge desk, a gift shop and plenty of seating for just hanging out. The indoor pool & hot tub are just around the corner. This is one of the few Panama City Beach resorts with an indoor pool & hot tub! Just outside is the 20,000 sq ft beach front pool complex with its giant hot tub and tiki bar and grill for snacks and drinks on the pool deck. The pool is the largest on the beach with a zero entry area. Enjoy a great workout in the state of the art fitness center. The onsite spa is great for relaxing treatments of all kinds, too. The sauna and steam room are great for unwinding after a day on the beach. During the summer months, the Kid’s Club is in full swing with lots of activities. Everyone is welcome of course! Although the responsible party booking this reservation must be 25 years of age or older and remain present throughout the entire stay. Shores of Panama 1003 located on floor 10 is a spectacular unit and has an amazing view of the magnificent Gulf of Mexico and the incredible pool. In the living room you will love the updated renovations with high end accents throughout and the beautiful Beachy décor of this condo. You’ll love the open floor plan and nautical touches in this unit, too. Two comfy sofas and a big flat screen TV to watch the "Big Game" or cozying up to a nice movie. Step out the sliding doors onto your enormous private balcony and feel the gentle ocean breezes on your face. The pool view is gorgeous and the gulf view is even better. 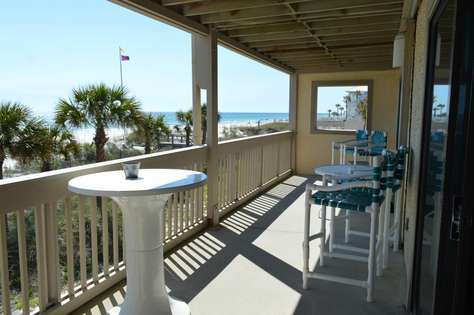 You’ll love sitting on the balcony with a cold beverage after a long day at the beach. Welcome to your home away from home! The fully updated kitchen with brand new stainless steel appliances, cooking will be the real deal. A great perk is you can see the ocean view right from the kitchen so youll never miss out on the action. All the cookware and utensils you’ll need to do anything from popping a bag of microwave popcorn for a scary movie or cooking a gourmet meal are readily avaliable at your fingertips. The Master Bedroom is sure to please! A king sized bed attached to a Beautiful wooden bedframe and dresser sets the elegance of the spacious room. A flat screen TV is provided as well as a stunning view of the gulf when you have your monring coffee. Attached is your very own Master Bathroom stylishly decorated with a full Tub and vanity lighting. The second bedroom will really knock your socks off! There are two full beds so plenty of space for the kids sleepover or couples trips! There is a flat screen tv and it is conviently attached to your own bathroom! The guest bathroom is very spacious and has a standing shower sink and washer and dryer on the side. There is also an added bunkbed in a private hallway area with it's own private half bath! How convienent! Shores of Panama is a perfect location because it is a short drive from some of the best attractions of Panama City Beach! Pier Park, Shipwreck Island and Wonderworks just to name a few. Unit 1003 Shores of Panama is where you will take your family and friends for years to come! THIS UNIT IS HIGHLY REVIEWED. Take a look at our condo's location …Wow! This 4th floor condo is located where everyone wants to vacation! An amazing condo, in an amazing location, in an amazing resort. If you think you might like to go sailing while on vacation please read this whole description. Everyone is welcome of course! but, the responsible party booking this reservation must be 25 years of age or older and remain present throughout the entire stay. Your new vacation destination is located on the 4th floor overlooking the beautiful Gulf of Mexico. You will be given your own personal, secure door code and may go directly to the condo. No waiting in line to check in! Simply drive up the ramp to your very close, reserved parking space in the 4th floor parking garage, roll right down the walkway past the indoor pool/hot tub, then to the gulf front units and you are at your door! You will be delighted with the comfortable accommodations and tasteful de'cor. The best part is the convenience!!! No need for elevators!!! You will be thrilled with your view from the balcony! It is private and quiet, but so close to everything! 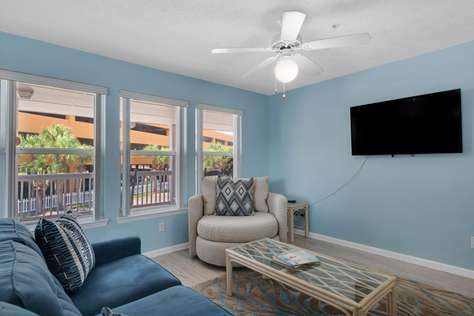 Of course your new vacation destination comes with all the added luxuries you'd expect, such as FLAT SCREEN TVs, DVD PLAYER, CD STEREO, WASHER AND DRYER, OUR PERSONAL WI-FI, and Fully Furnished Kitchen. We've skimped on nothing for this vacation condo. The Master Bedroom has a huge closet and is as comfortable as any 5 star Hotel. Each bedroom comes with its own bathroom. That's right, each bedroom, meaning that the bunk room in this condominium has been enclosed, making it the 2nd bedroom. 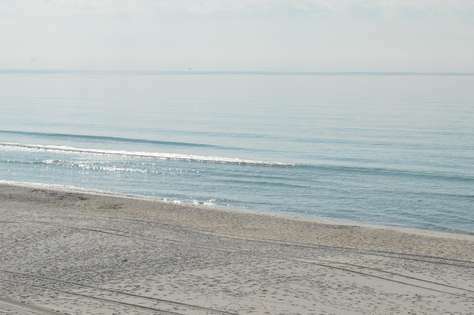 Everything you could want or need off the beach is only a short distance away. We are across the street from Wal-Mart and next door to Pineapple Willy's, a Waffle House and major top-rated restaurants. In addition, you will find a couple of Red Box rental locations, Ripley's Museum, go-carts and other family activities all within walking distance of the condo. Pier Park, a short drive away, offers great shopping, dining and an exciting night life! This condo is an 'end unit' with a spacious wrap around balcony overlooking both the beautiful beach and lagoon pool. You'll have phenomenal views of all the beach and pool activities! The master bed room directly over looks the beach with incredible views too. The living room has breathtaking panoramic views of the beach and lagoon pool (there's even a telescope for you to explore with). You won't have to use or wait for an elevator as the condo is located right next to the steps that will lead you to the sandy beach and tropical pool. This 2 Bedroom 'corner' condo with 2.5 bath is located on the 4th floor. It also has a separate bunk room with its own bathroom. The unit is luxuriously furnished including ceiling fans, decorator furnishings, granite counter tops in a fully equipped kitchen with microwave, range-oven, dishwasher, refrigerator w/ice maker, washer/dryer, and all new bueatiful plank tile floors throughout the unit. The living room has a LCD flat Screen TV with DVD and a surround sound stereo system. LCD TV's with DVD's will also be in each bedroom. We also provide hair dryers in each bathroom, many types of board games for the kids, a card table with chairs, two cordless phones and other extras. The unit will sleep 6 with a premium king-sized bed in the master bedroom, a premium king-sized bed in the second bedroom, twin bunk beds in the bunk room. All sheets are 600 thread count. The condo has reserved covered parking as well as complimentary valet (seasonal) parking. Additional unassigned parking is available in the covered parking deck on a first come first served basis. The condo will be non-smoking and pet free. We have FREE Secured WiFi in our condo. We have FREE Long-distance calling. Several outstanding restaurants are within a short walking distance, including world famous Pineapple Willy's right next door. 'Willy's Pier Bar' is located next to Pineapple Willy's which is a great place for live bands playing jazz, blues, country and rock music. THIS UNIT IS HIGHLY REVIEWED. Take a look at our condo's location …Wow! This 7th floor condo is located where everyone wants to vacation! An amazing condo, in an amazing location, in an amazing resort. If you think you might like to go sailing while on vacation please read this whole description. Everyone is welcome of course! but, the responsible party booking this reservation must be 25 years of age or older and remain present throughout the entire stay. Your new vacation destination is located on the 7th floor overlooking the beautiful Gulf of Mexico. You will be given your own personal, secure door code and may go directly to the condo. No waiting in line to check in! Simply drive up the ramp to your reserved parking space on the 7th floor parking garage, roll right down the walkway past the indoor pool/hot tub, then to the gulf front units and you are at your door! You will be delighted with the comfortable accommodations and tasteful de'cor. The best part is the parking convenience!!! No need for elevators!!! You will be thrilled with your view from the balcony! It is private and quiet, but so close to everything! All of the other Shores of Panama listings on VRBO boast the many amenities of the property and the surrounding area of Panama City Beach. Perhaps you look forward to enjoying a cocktail watching the sunset. Either way, your balcony view is one of the best that Shores of Panama offers. The Master Bedroom has a huge closet and is as comfortable as any 5 star Hotel. The bedroom and the bunk room each come with their own bathroom. That's right, each bedroom, meaning that the bunk room in this condominium has been enclosed, making it the 2nd bedroom. Come enjoy fabulous sunrises and sunsets along with panoramic views of the beach!!! This magnificent gulf front condo located on the 7th floor has 2 bedrooms with king size beds and private baths in both with access to the balcony from the master. It also has a bunk room with 2 twin beds, and it's own half bath. This does come with a RESERVED PARKING SPOT. It is located on the same floor. The spacious wrap around balcony overlooks both the beautiful lagoon pool and the emerald waters of the Gulf of Mexico. It also comes with it's own reserved parking space located beside the door entering from the parking garage. Just a short walk down the hallway to this end condo unit. 2 elevators right around the corner from the condo makes getting up and down from the pool and beach a breeze also!! The living room has a queen size sofa bed with phenomenal views of the pool and ocean. Adjacent is the fully stocked eat in kitchen with granite countertops. Washer and Dryer is also provided. 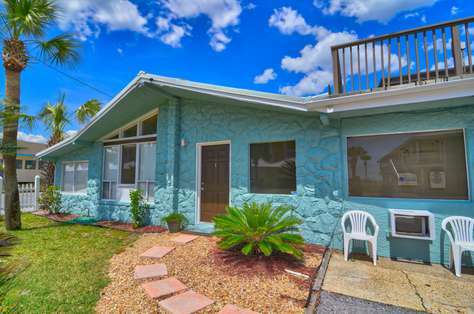 Sunkissed beach cottage will provide you your best beach vacation yet! 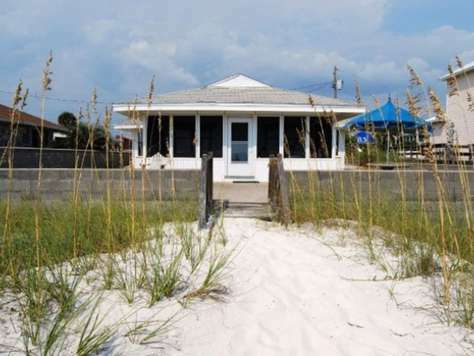 Just one house off of Front Beach Rd and right across the street from the gated beach access, this Florida style cottage offers some extras that are rare in Panama City Beach. Located on the private and dedicated Bid-A-Wee Beach, you will truly be able to stretch out and relax as part of the exclusive few who can access and enjoy this pristine sugar-white beach. We offer an oversized lot with ample parking for your multiple vehicles, boat, jet-skis, or even your RV (no hook-ups available). 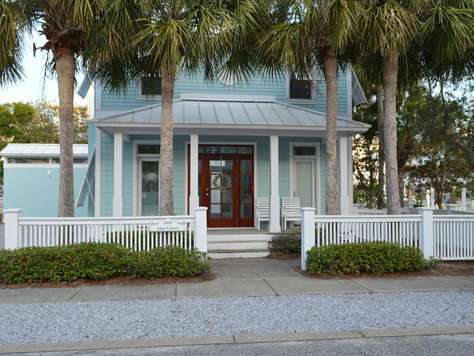 As you walk into this bright cottage, you will immediately appreciate the open, beachy feel. Large windows throughout the home provide plenty of natural light. The comfortable furnishings and versatile sleeping options will accomodate your family of 2 to 6 people with your choice of 2 twin beds in one room, 1 queen in the second bedroom, and a king bed in the master bedroom. The cottage also offers a fully equipped kitchen for all your cooking needs. There is also a washer/dryer for the added convenience to maximize your vacation. You will truly fall in love with this vacation getaway. Everyone is welcome of course! but, the responsible party booking this reservation must be 25 years of age or older and remain present throughout the entire stay. And thank you for leaving your pets at home, as we do not allow pets due to allergy issues. Call BeachyCations today to book you vay-cay getaway! 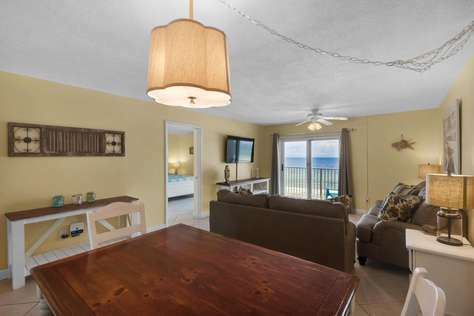 This 1,670 sqft 3 bedroom & 3 full bathroom Corner Tidewater unit with bunks and a sofa sleeper is located right on Panama City Beach; Florida, with great shopping within walking distance of Pier Park and the Pier. No need to take a car anywhere as most places are walking distance. Not only is this luxurious rental unit located in one of the best condos on the beach, but you’re also in one of the most prestigious units being a corner unit with an absolute breath taking view of the beach and the city pier is sure to win you over with a turn of the door handle. As you open the door, you’ll be amazed with floor to ceiling windows. All updated kitchen appliances and granite counter tops. Master and first bedroom have King and second bedroom has a queen bed. There are also bunks in the hall so no more fighting over rooms! Each and every day you wake up from your bed, you'll see this views most people dream about, overlooking the beach from each bedroom. 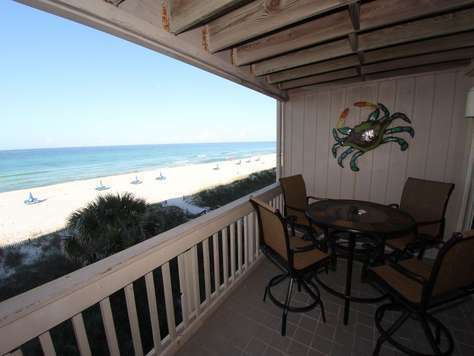 Drink your morning coffee on the very large balcony over the Gulf of Mexico. This unit will make memory's to talk about for a life time. We hope to see you very soon. We know you’ll fall in love with this unit each and every time you stay. 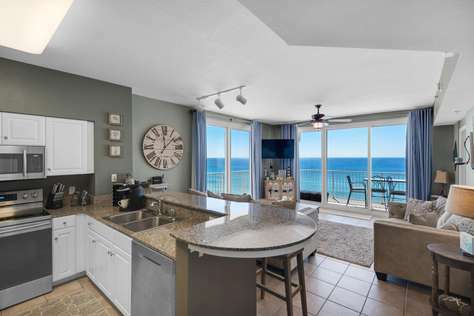 This unit offers amazing views of the beach and the county pier from the large balcony that you may never want to leave! Really! The condo is an end unit so you will have the most spectacular panoramic views of the beach. The sunsets are breathtaking so be sure to get those in too! The condo will feel like your home away from home and with all the comforts. It’s tastefully decorated with a relaxing feeling. You'll be in paradise! We felt the location, views and activities were perfect for our family and friends to enjoy. It's just perfect! We know you’ll enjoy it. Everyone is welcome of course! but, the responsible party booking this reservation must be 25 years of age or older and remain present throughout the entire stay. Also, pleae not Tidewater requires all guest to register upon arrival, this is where you get wristband and parking passes. There is a small registration fee of $25 paid at this time directly to Tidewater. Hope to see you soon. This 1st floor condo is located where everyone wants to vacation! It doesn't get much better than this. An amazing condo, in an amazing location! Everyone is welcome of course! but, the responsible party booking this reservation must be 25 years of age or older and remain present throughout the entire stay. This newly listed vacation destination is located on the 1st floor with views of the pool and the beautiful Gulf of Mexico. 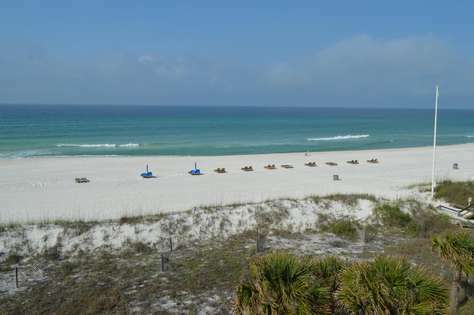 This Condo is situated on the east end of Panama City Beach near St. Andrews State Park. This recently updated condo has a King in the master with private access to the patio area and a queen in the 2nd bedroom. It also features a set of bunk beds built into a nook area in the dining room. The master bathroom has a stand up shower, seperate room for the toilet, double sink vanity area, and a large walk in closet. The second bathroom is accessible from the hallway or second bedroom and has a tub/shower combo. You will enjoy the evening sunsets from the extra long private patio and the added convienence of being so close to the pool for the family fun times. The open concept living, dining and kitchen has beautiful views of the beach from the back sliding glass doors, that cover from floor to ceiling to allow the wonderful views to come in, but all the noise of the ground floor to stay out. The unit has a fully equipped kitchen, high top dining table for 4, an extended bar area with 4 bar stools, a washer/ dryer, and reserved parking spot just steps away fromt he front door. This complex offers a seasonally heated extra large pool, hot tub, gas grill area on the 3rd floor, charcoal grill area on the pool deck, two covered gazebos for event/parties, and a newly updated fitness room. The property also has a Liza's Cafe onsite for a quick lunch or for pool side dining. Liza's Cafe has some of the best sandwiches on the Beach. Treasure Island also offers their own Beach Services directly behind the property where you can rent chairs and umbrellas, by the day or by the week. Grandview East is an adorable three bedroom, two bath condo is a MUST STAY! Gulf front views from the large and spacious living/dining/kitchen area are fabulous through the floor-to-ceiling windows leading out to the large corner balcony. The kitchen features all major appliances, full stocked cabinets with pots, pans, and dishes, a single coffee maker for your K-pods, a large breakfast bar, and plenty of storage. The master bedroom has amazing views of the gulf of Mexico, completer with a king sized bed and large TV. The connect en suite has a garden tub, perfect for relaxing at a long day at the beach or bath time for the kids. It also has a stand alone shower and double vanities; giving you enough space for everyone. The second bedroom features a full size bed and a TV as well. You will find the second bathroom in the hallway across from the extra large laundry room with side by side washer and dryer. The 3rd bedroom has a couch that turns into a sleeper sofa, so you can use this room for the kids or a nice quiet area to relax while reading or enjoying an afternoon nap. The dining room table is large enough for the family and the overflow bar stools will make eating together a breeze. The living room has 2 chairs and a couch that also hides a sleeper sofa and a large screen TV for watching the games, but the floor to ceiling glass windows is definitely the main attraction in this room with views to the east and west. This resort is a SMOKE FREE resort. There is no smoking permitted on the resort, whether in the unit or on the balcony. If you are found to be smoking by the resort management staff, then you will be evicted immediately with no refund. The onsite amenities include an outdoor pool, a fitness room, and gas BBQ grills. Please note: Parking is located across the street from the condo and only one parking space provided between Memorial Day and Labor Day, additional is city pay per park one block away. Whether it's strolling on the beach, snorkeling, para-sailing or fishing, close by you'll find opportunities to enjoy everything there is to do in, under, above, or on the water. Everyone is welcome of course! but, the responsible party booking this reservation must be 25 years of age or older and remain present throughout the entire stay.